Were there certain things, activities, hobbies that you dreamed about doing alongside your children as they grew? One of the simple joys that I've been looking forward to is reading a book along with my son. Not a picture book or a board book [the days of The Hungry Caterpillar, Little Blue Truck, and the like are winding down], but an actual chapter book that I also loved as a child. One that interests both of us, but that he can understand. Roald Dahl has and always will be one of my favorite writers of all time. So magical! So imaginative! So unique! The list goes on. I was recently looking for a random document in our basement [which I never found], and I happened to glance at my old bookshelf, filled with books from my teaching years and those my mom has sent me from my childhood. 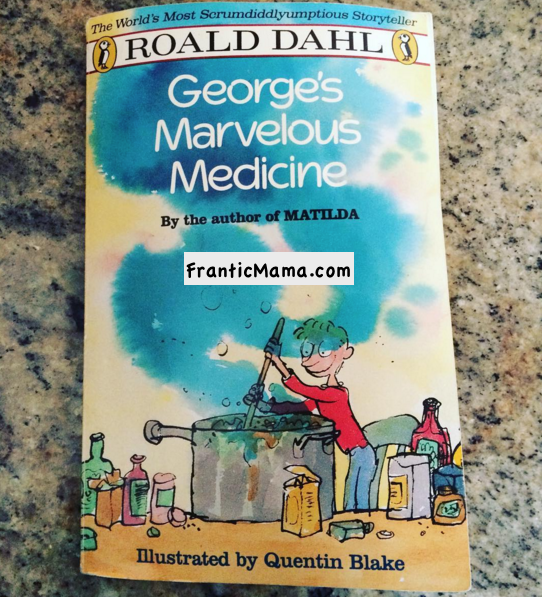 There it was: George's Marvelous Medicine, by Roald Dahl! You would think I had found a $20 bill in my jacket pocket I was so happy. I knew I had to play things cool at this point. We all know that if we are too excited about something, our kids decide that they are not at all excited about it, right? I casually held up the book with it's colorful cover and intriguing title, and said, "hey bud, maybe this will be our very first chapter book. We can read it together." He raised his eyebrows. His interest was piqued, and I knew what I had to do to clinch the deal. "It's for pretty big kids, though. It says it's for ages 8-12. I think you and I can probably handle it, but I'm not sure...what do you think?" "Oh, yes! I want to read it!" That's how you do it, folks. My son thinks 'big kids' are the coolest people in the world, and that's what sold him. The book is creepier than I remember (the grandma is pretty insane), and way less tame and PC than books written in today's era. But you know what? My little guy is loving it. So am I. It is FUN! How about you? What is something you can't wait or couldn't wait to do with your own children? Subscribe to Frantic Mama's Newsletter! Roald Dahl books are delicious. We had a reading marathon last summer , we devoured all the books with all of the willie wonka candy! You are at the start of the most magical of journeys! 'Nerds' and 'Gobstoppers ' go really well with George's marvelous medicine!! Well done mama- how you lit the spark in your little guy. Have Fun!! Aren't they just the best?! We have now finished George, and I am currently deciding which one is next... :). Which one is your favorite? We loved Charlie and the chocolate factory and then Charlie and the great glass elevator!!! Autobiographical 'boy' is great too and every Roald Dahl fan must have it! But your little boy needs to be just a little bigger for that! Happy Happy reading! I just finished reading Charlie and the Chocolate Factory to Andrew last night. I've also read him the BFG. Roald Dahl was my favorite as a kid and I couldn't wait to share the books with my kids!